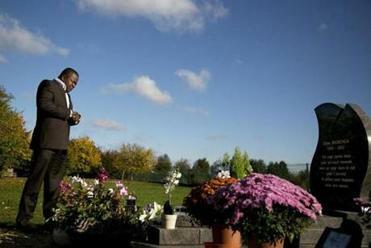 Yodi Zikianda cried at the grave of his wife, a French citizen who died at age 29 while in US custody. Last year, ICE detained a record 429,247 foreign nationals — more than double 2001 levels — and deported 396,906 immigrants, at least 180,000 of whom may have been here illegally but had no criminal record. By ICE’s own estimate, many thousands of them could have been spared deportation under its 2011 policy of “prosecutorial discretion,” or selectively enforcing the law. In Irene Bamenga’s case, records show that the border agents had filled out a form that could have cleared the way to let her go. On the form, they listed no threat posed by Bamenga except that she was “likely to add to the illegal population.” But agents did not list her medical condition, which could have been a reason to let her fly to France on her own rather than face detention. The agents detained her anyway. Their names have been blacked out in records obtained by the Globe under a Freedom of Information Act request. “The problem is, Ms. Bamenga is just a really horrible, specific example of the system,” said Joanne Macri, head of of the Criminal Defense Immigration Project for the New York State Defenders Association, who raised questions about the case after Bamenga’s death last year. “I would have said, ‘Your Honor, I’m sick,’ ” Macri explained. Immigration officials say they decide whether to detain someone, within “a reasonable period of time,” and the immigrant will be brought before an immigration judge “as soon as is practicable,” and that can depend on the judge’s docket. In 2010, Maricopa County Sheriff Joe Arpaio, the 80-year-old Springfield, Mass., native known as “America’s toughest sheriff,” raided the Sizzler as television cameras recorded the event, arresting Tamayo and several other Latino employees for identity theft and other crimes that day. ICE said Tamayo is ineligible for Obama’s program because of the felony conviction. “Ms. Tamayo’s criminal history makes her ineligible for discretion under the agency’s current guidelines,” said Amber Cargile, an ICE spokeswoman in Arizona. “I was one of the people who went there, obeyed the law . . . and registered themselves,” he said recently. The refusal of immigration officials to release detainees’ names makes it difficult to investigate the cases of some of the longest-held prisoners, but one case in Massachusetts shows how an extraordinarily long “administrative detention” could happen. Hernandez, who did not want to comment for this article, was a broken man in a wheelchair by the time he was released, but ICE officials say they followed protocol. An immigration spokeswoman said that Hernandez was “afforded numerous parole interviews” during his incarceration, but that ICE’s associate commissioner for enforcement ruled that his release would not be in the public interest. “Any kind of proceeding that isn’t open, that isn’t public, is subject to abuses,” said Barron. The month before Bamenga was arrested in July 2011, ICE director John Morton issued a memo urging immigration officials to use “prosecutorial discretion” in deciding whether to lock someone up. They should be arresting people who represent a threat, he wrote, while going easy on people such as victims of crime, women nursing children, or people with serious medical illnesses. But the very next month, Border Protection agents at the New York-Canadian border brought the “full scope” of federal authority down on Bamenga, and ICE detained her even though she appeared to qualify for lenience under Morton’s memo. “Lots of them,” she had replied, according to an observation report filled out in the booking process. She even brought them with her, and turned them over to ICE officers. “They should have brought us back Irene,” her mother, Marie Madeleine Nelo, cried out in French in the living room of her home, where she hosted a reception after the ceremony. “You’ve made the grave, you’ve done what you should have done, you go on with your life,” a family friend, Daphine Paris, said, roughly translating the solemn exchange. “It was the pursuit of an American dream,” Zikianda said. Milton J. Valencia can be reached at MValencia@globe.com. Follow him on Twitter@MiltonValencia.